Mariann has handled unimaginable pain and heartache with grace and dignity. While on a business trip in South Africa last year she sustained a life altering spinal cord injury after a catastrophic car accident. Her husband, Scott, and her best friend/co-worker, Trudy, did not survive the crash. After 3 weeks of dodging monkeys in South African streets, negotiating flights, and spending day after day in hospitals, Mariann’s family successfully had her flown back to the U.S. Despite her physical limitations and having to learn to do basic activities a new way, Mariann is living life to the fullest. 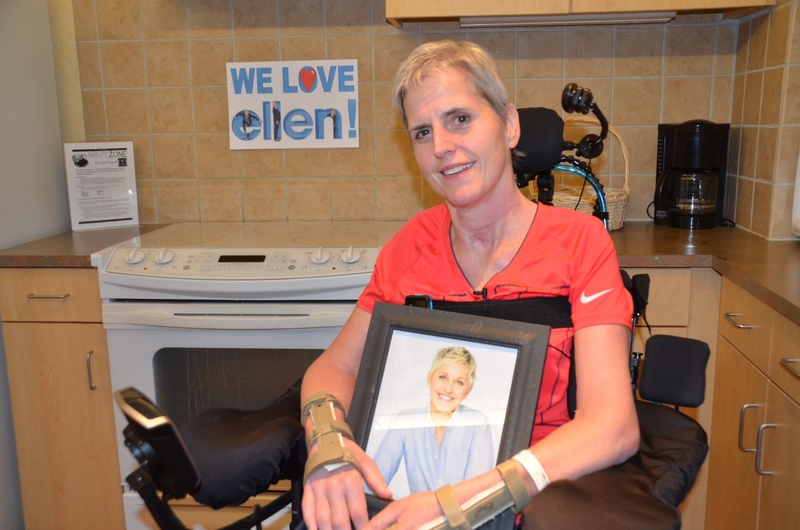 “She is always positive and funny and she inspires other patients,” said Bill Scelza, MD. Mariann’s interdisciplinary team wanted to do something special to show her how much she means to them. They created a dance video inspired by Mariann’s love for the Ellen DeGeneres Show.